I'm not a millionaire and this may have been one of the reasons why I got an idea to construct a small sailing boat (like an ultra-light plane) that could be bought by everybody. The problem was to construct an ultra-light boat that would be strong, easily transportable, cheap, of great bearing capacity and large board; a boat in whose sailing properties both experienced yachters and absolute beginners would be delighted. Combination of so many requirements seemed to be insoluble at first sight but thanks to constructive skills of several professionals, we managed to construct such a boat after two years of work. 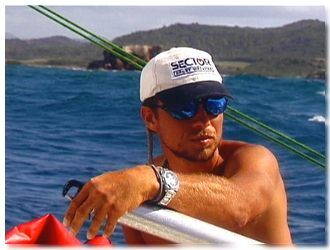 In spring 2000, we crossed the Atlantic Ocean on SECTOR catamaran- the lightest boat in yachting history of the Ocean's crossings over. During this sail, we ourselves tried how perfect EasySail's structure is. The boat has met and even surpassed our expectations. Therefore, we have prepared its five-meter variant for sale. We are pleased by interest and positive experience of you, our customers, very much!